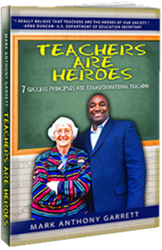 Teachers Are Heroes is a new book by former special needs student and motivational speaker, Mark Anthony Garrett. “... there is no way to underestimate their importance. A teacher has so much power in their hands, and as you can see from my personal story, when a teacher truly cares, it can be life changing," say Garrett. One third of American seniors lack math proficiency. As much as 42 percent of college students require remedial language and math once they reach college. Students even in wealthier districts with money for SMART education struggle to educate. According to educational consultant and motivational speaker Mark Anthony Garrett, all is not lost. Things are not hopeless. All across the country there are success stories coming out of charter schools, inner city classrooms, and rural districts because teachers who care, who are motivated are finding ways to reach students and empower them to learn. Teachers Are Heroes - 7 Success Principles for Transformation Teaching is the newest book from Garrett, written from a deeply personal perspective. Garrett was a physically and sexually abused child, caught in the US foster care system. He might have been lost to the stress of his home life, school and being a special needs child had it not been for a dynamic teacher who stepped in and made a difference. Betty Jean Ritchie was his hero. She not only worked with him to get ahead in his schoolwork, but also motivated him to go the distance and never give up on life. Garrett credits her perseverance, love and compassion with his eventual personal and business success. The 7 Success Principles within this book will help inspire them to teach with passion and remind them of how truly important they are in the lives of the students they serve. It’s time to remind the world of just how important these heroes are to our society.